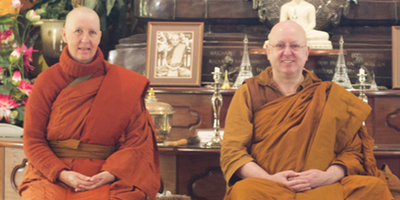 Ayya Santacārī Bhikkhunī is the Spiritual Director of the Buddhist Society of South Australia. She visited Sydney from Adelaide for a short period of time, and she gave a public talk at the Metta Centre on the importance of basing our Buddhist practice in gladness. Ayya Santacari’s talk references various Buddhist scriptures, and was an open space for sharing, discussion and reflection on our spiritual journey. Ayya Santacari is a Buddhist nun, practising meditation for over 24 years. During that time she has learned and practiced many methods and approaches such as mindfulness, vipassana, tranquility, samatha, jhana and open awareness. Ayya Santacari has undertaken retreats in Adelaide, NSW, Myanmar, Thailand, Malaysia and the USA. She has learned from esteem teachers such as Sayadaw U Vivekananda, Pa Auk Sayadaw, Sayalay Ariya Nani, Ayya Tathaaloka Theri, Ayya Sobhana Bhikkhuni, Ajahn Sujato, Ajahn Brahm, and Patrick Kearney.